During the first Great Depression, (as opposed to the one we’re enjoying now), dumplings were a Southern staple. The dumplings were pretty much the same, but the meat in the pot varied from the standard chicken to squirrel, rabbit, bits of ham, and whatever else happened to be available. They were basic but filling. Our 18th century ancestors enjoyed them for the same reasons our grandparents did – they were inexpensive, filling, and could be made quickly with whatever tidbits the cook had at her disposal. H. Pitman who referred to himself and his brother as white slaves were most likely indentured servants, the only difference being that the latter might attain freedom after a prescribed period of time. One usually fared no better than the other in any other respect. In June 1689, his diet was coarse and mean, rations consisted of 5 lbs. of salt Irish beef, or salt fish, a week, for each man; and Indian or Guinea Corn [maize] ground on a stone, and made into dumplings instead of bread. For more substantial information on making dumplings we will first consider T. Williams’ published receipt for Hard Dumplings in 1717. Make a little salt, flour, and water, into a paste, and roll them in balls the size of a turkey’s egg. Roll them in a little flour, throw them into boiling water, and half an hour will boil them. If you choose it, you may put into them a few currants. They are best boiled with a good piece of beef. Williams’ Norfolk Dumplings contained eggs, and milk and were made up into a thin batter that was dropped into boiling water. They were drained in a sieve, and dressed with butter before serving. Norfolk dumpling receipts were common throughout the 18th century. In 1769, E. Taylor published the following receipt. Yeast Dumplings. Make a light dough with flour, salt, yeast, and water as for bread, set it before the fire covered with a cloth, half an hour to rise; make it into round balls the size of a goose egg, flatten them with your hand, put them into boiling water, and let them boil twelve minutes. Send them to table with melted butter. That book contained another receipt for Butter Dumplings which contained fat the other one did not, but no leavening agent. “Take a good piece of butter, rub it into your flour, and make it like crust for a pye. Make it up into dumplings, and boil them half an hour”. Charles Carter, Elizabeth Raffield, and Hannah Glasse published dumpling receipts (1749, 1769, & 1774 respectively). Gentle reader, by now you have no doubt divested yourself of the knowledge of the commonality of dumplings served throughout the 18th century. As yet, no chicken, has flown across the pot, yet you have not failed also to note that each of the previous receipts was published in old London. J. M. Sanderson’s The Complete Cook, published in America in 1846, gave receipts for adding dumplings into a liquor [broth] made from chicken parts (the faint-hearted may prefer not to know which parts, suffice it to say the part that did the thinking and the parts that did the walking), and into mutton liquor. The latter was enriched with turnips, carrots, and onions, a practice still common in the Appalachians. He also suggested parsley and marigold blooms, the latter used to color the broth. Sarah Ellis used minced ham for dumplings in 1843. In her version the ham was placed on the dough and sealed up before dropping them into the simmering liquid. 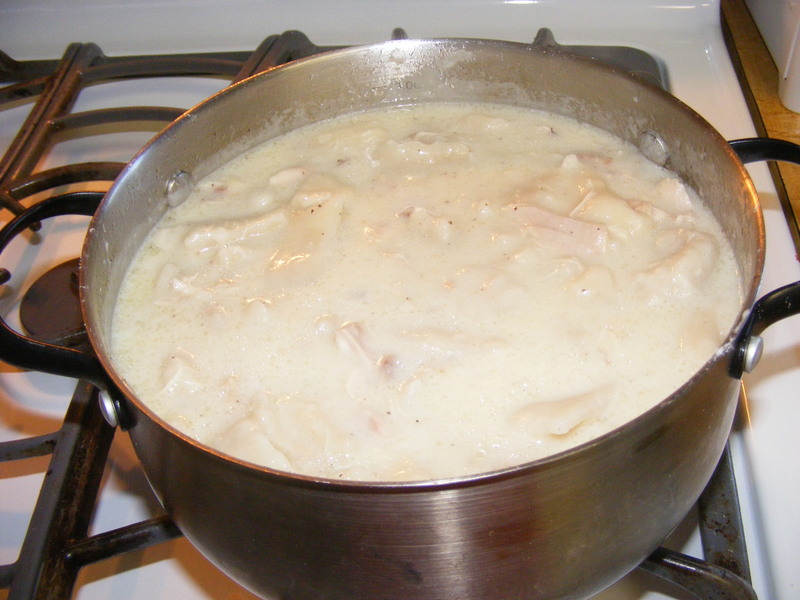 By the 1930’s, few bothered with that and chose to put the meat in the broth and drop in the dumplings. To limit the length of this epistle, we shall content ourselves with the early history now that we have placed the dumplings in the chicken broth and entertain the notion of making this classic comfort dish suitable for a weeknight supper or Sunday dinner. 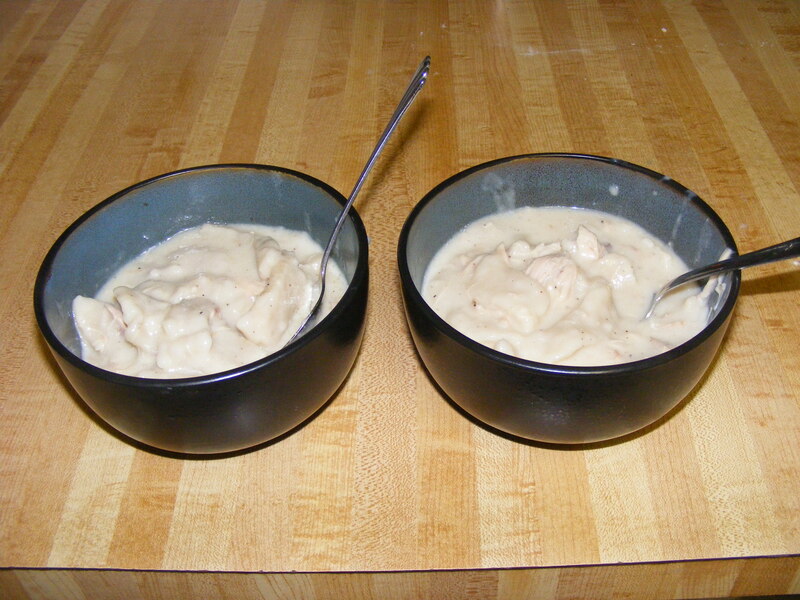 For an account of thickening soup with dumplings see my soup history offered in the book shoppe on this site. Simmer any quantity of chicken or other meat with salt, pepper, and vegetables if desired, until falling-off-the-bone tender then remove it to a plate to cool. Pick off the meat, placing it back into the pot of broth, and discard the bones and gristle. The onions, carrots, and celery can be tossed with the bones or left to further enrich the dumplings at your discretion. Bring it back to a slow simmer. Meanwhile, for the dumplings, place 3 to 4 cups of plain flour into a mixing bowl. Add 1 teaspoon baking powder and 1 teaspoon kosher salt. Add enough milk to bring this together into a soft dough – careful not to overwork the dough or the dumplings will be tough and indigestible. 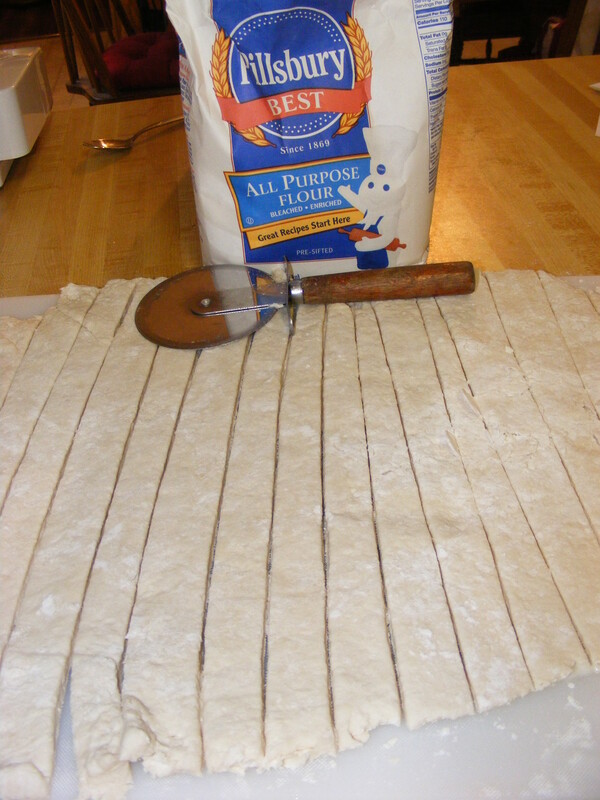 Roll the dough out and cut into strips. Pinch the strips into the simmering broth and allow to simmer some 15 to 20 minutes. Do not stir the dumplings aggressively, although you may very gently move then around to prevent sticking and make room for more. Stirring will result in an unappetizing amalgamation of loose dough. To add to the richness of the dish, my secret weapon is a teaspoon of chicken base when I bring the broth back to a simmer to give the simmered-all-day body I grew up with but without spending all day to achieve it. I also add a half cup or so of heavy cream at the end of the cooking time, with a modicum of chopped parsley if there happens to be any growing in my herb garden. Ever so gently stir the cream in, turn off the heat, and allow to rest 15 minutes or so before serving. This is sure to bring a smile to your dear one’s lips, but do not despair if even this seems more effort than you are willing to expend. 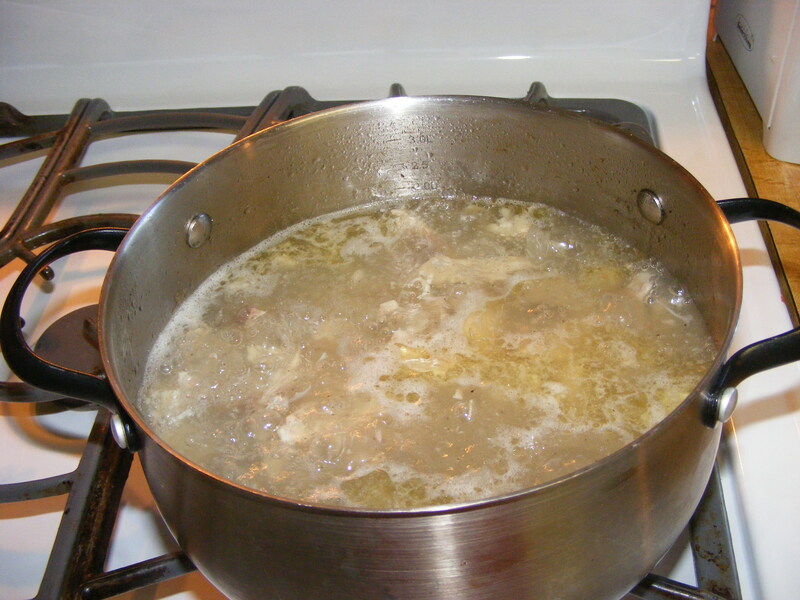 If you debone a store-bought rotisserie chicken and place it into a quantity of water enriched with that afore-mentioned chicken base, or even canned broth, you can speed up the process to the point that start to finish your pot of delicious yumminess can be served within roughly a half hour. Blissful Meals, Yall, I’m about to enjoy left-overs from last night’s dinner. Taylor, E. The Lady’s, Housewife’s, and Cookmaid’s Assistant: Or, The Art of Cookery. 1769. London. Day, John. The Works of John Day. 1608. London. Williams, T. The Accomplished Housekeeper, and Universal Cook: Containing all the Various Branches of Cookery. 1717. London. Stuart Tracts, 1603-1693. Ed. Firth, Charles Harding. NY. Pepys, Samue. The Diary of Samuel Pepys. 1663. NY. Sanderson, J. M. The Complete Cook. 1846. Philadelphia. Ellis, Sarah. Mrs. Ellis’s Housekeeping Made Easy. 1843. NY. Rumble, Victoria. Soup Through the Ages: A Culinary History with Period Recipes. 2009. McFarland Publishing Co., Jefferson, NC.